Oia Santorini. The ornament of our island. Oia Santorini is one of the most graphical and well known villages of the island. It is located at the north-west tip of Santorini, 11 km north of the island’s capital, Fira. In the past, Oia was also called “Pano Meria”, which translates as “the upper side” in Greek. Local inhabitants of Santorini still refer to Oia as “Pano Meria”. Oia Santorini, as a picturesque village, is visited by thousands of travelers every year from all over the world. It hosts tourists of every age and culture. It is one of the most beautiful among Santorini villages. 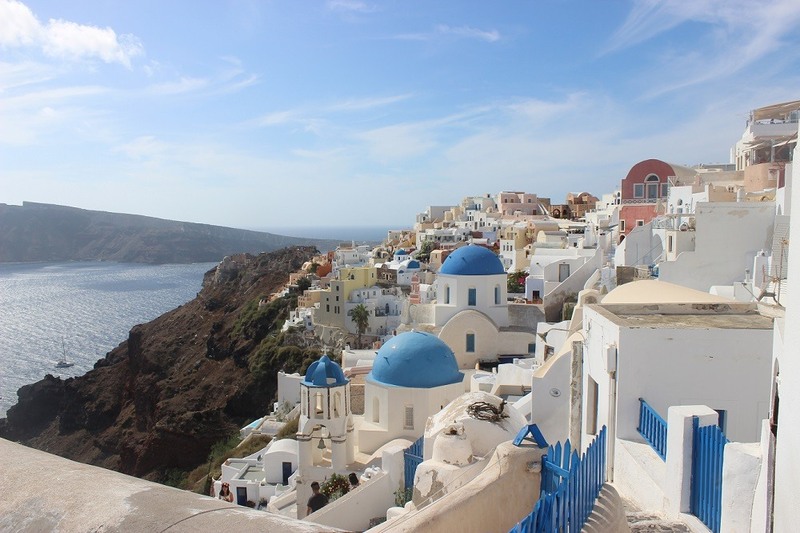 In Oia, you will find everything you need for a pleasant and unforgettable vacation. The most luxurious hotels are located on the west side of Oia, offering a breathtaking view of the volcano and the caldera, as well as all the west side of Santorini and its spectacular cliffs. Oia also hosts luxurious taverns and restaurants that offer a fantastic view of volcano and sunset. There is nothing more romantic than having dinner during the world most famous sunset. In the alleys of Oia you will also find taverns which offer fantastic dishes, prepared the santorinian way, with local ingredience. The second thing that will impress you, beyond the fantastic view, will be the Oia’s architecture. The Cycladic white houses built the traditional way by the 19th century ship captains and sailors, a whole lot of churches, built in memory of sailors, almost everyone with a different colorful bell, will definitely be a motive for may photographs. As you explore the colorful alleys of Oia, you will discover boutique tourist shops where you can buy a souvenir, a gift for your family back home or jewelry. The present of art galleries in Oia can’t bypass you. This village is one of the favorite places for artists. Painters and sculptors are overwhelmed by the beauty of Oia, therefore they want to share their work of art with visitors from around the word. Oia is also a “place to be” for history lovers. By itself, Oia is a cultural monument, but beyond that, the village hosts a maritime museum, ruins of a Venetian castle that belonged to Argyri family and today, due to its location on a hill, is one of the hot spots of Oia because it offers a fantastic view of all Santorini. This graphic village is built on a cliff, but it also has its port. Right below Oia there is Ammoudi port. A small but very beautiful structure that hosts traditional fishing boats that supply Oia taverns and restaurants with the most delicious and fresh fish and seafood. In Ammoudi there are also few taverns and cafes. From this spot, you will depart for your daily cruise that you can book via your hotel or one of agencies in Oia Santorini. You can participate in a sunset cruise, an unforgettable experience, or in a round Santorini cruise during which you will visit many of the island beaches. Finikia Santorini. The uprising beauty.